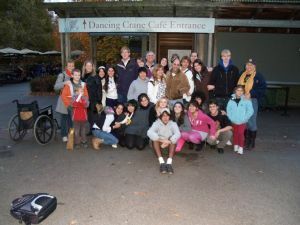 Rocky Point Rotary's three inbound exchange students visited the Bronx Zoo on Veteran's Day. Louise Timms of the Middle Island Rotary Club joined the group and provided transportation for Arno Johannes Ranta-Aho (Finland), Lucille Touveron (France) and Jordi Fernandez (Mexico). The trip was arranged by Middle Island Rotary's Dr. Dave Hensen. Looks like the whole tribe had a wild time!